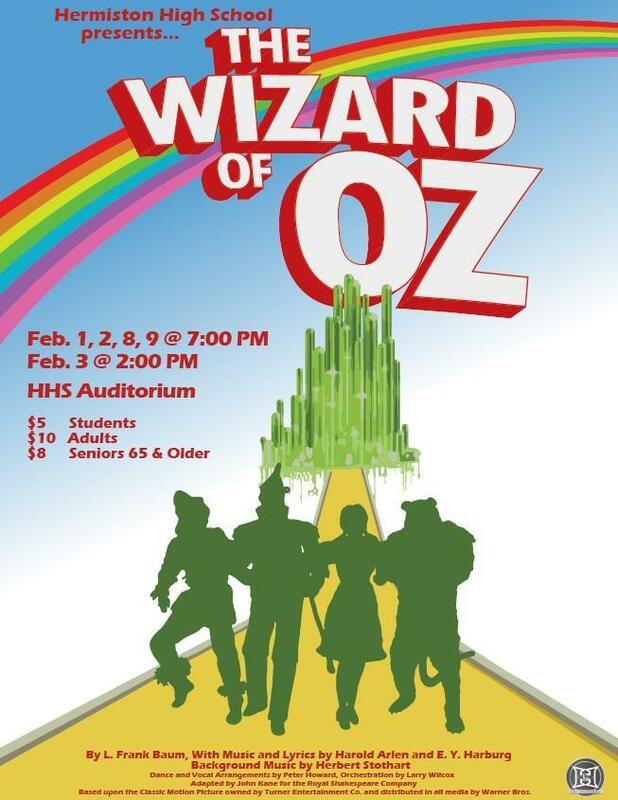 Evening performances are scheduled for February 1, 2, 8, and 9, at 7 p.m., and a matinee performance will be held on February 3, at 2 p.m.
Hermiston High School will present the musical The Wizard of Oz. Evening performances are scheduled for February 1, 2, 8, and 9, at 7 p.m., and a matinee performance will be held on February 3, at 2 p.m.
All performances take place in the high school auditorium. Tickets are $10 for adults, $8 for senior citizens 65 years and older with ID, and $5 for students; they may be purchased in advance at the high school bookkeeping office or at the door. Seating is general admission, but groups of ten or more may purchase reserved seats by e-mailing Dr. Beth Anderson at anderson@hermistonsd.org. The high school’s Drama Club will sell refreshments and t-shirts featuring the graphic from the show’s poster, during intermission. After each performance, the cast will be available for photos in a designated area outside the theatre.